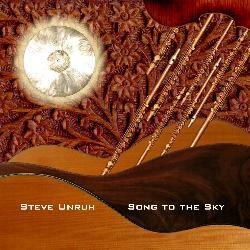 Credits: Steve Unruh - Acoustic guitars, violin, drumkit, flute, electric bass, vocals, tabla, congas, kalimba. Composed & recorded by Steve. Released 2005. Style: Acoustic progressive folk/rock. Sort of a cross between 'The Beginning of a New Day' and 'Invisible Symphony,' but with a fresh arrangement style, and lyric content reflecting where I am, philosophically, today. Instantly one of my favorite albums that I've made. What the critics have said about "Song to the Sky:"